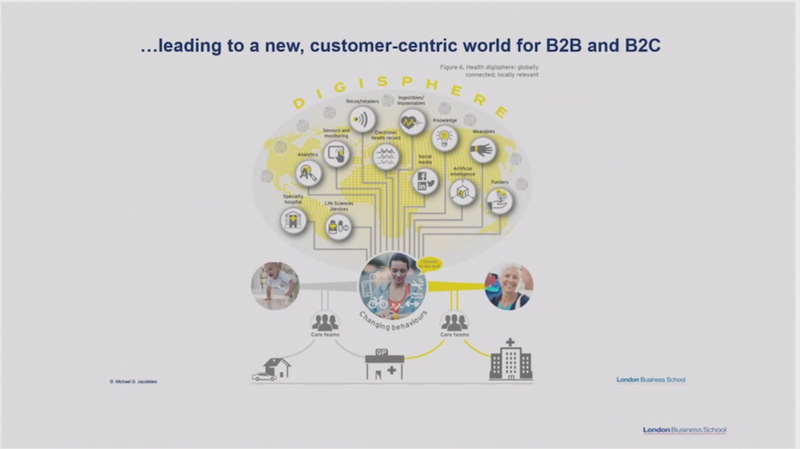 I’ve been attending the live stream from the Peter Drucker Forum in Vienna for the fourth year in a row. This conference is always really good value, and I usually find it has a few particularly great sessions, often focused on one or two key issues, not necessarily connected to the formal theme of the conference. This year’s event has focused on the Human Dimension, but for me, the best insights have been around networks, ecosystems and platforms. 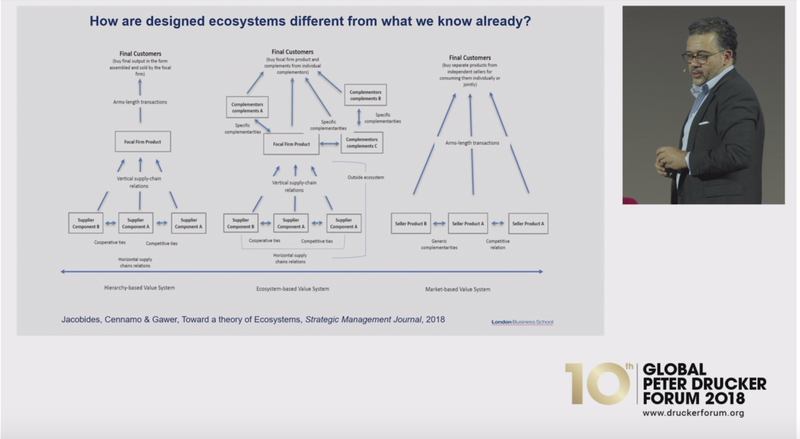 I wrote about platforms and ecosystems in The Social Organization, but only briefly, partly because I ran out of time / wordcount, but also because they’re relatively new and I’m still developing my understanding of them. So I was pleased to gain more insight at the forum. 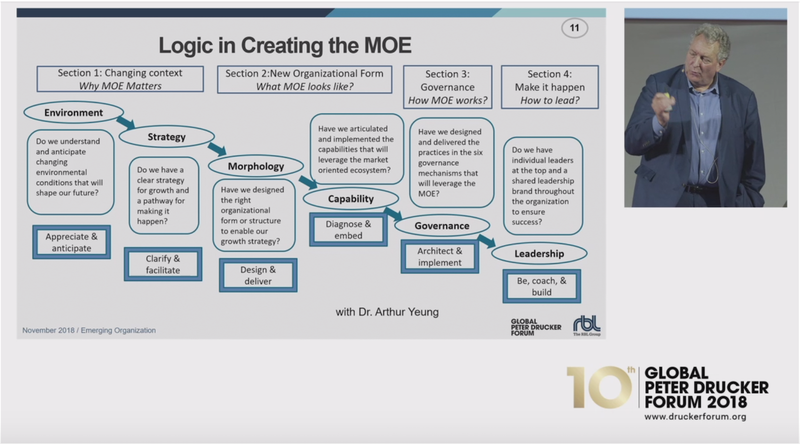 First up yesterday was John Hagel, who spoke about developing creative organisations, but also mentioned his work on business practice design. That diverted me onto the Centre for the Edge’s site to do some multi task reading on this, as well as on network organisations, which I’ve written up on Organization.Social. 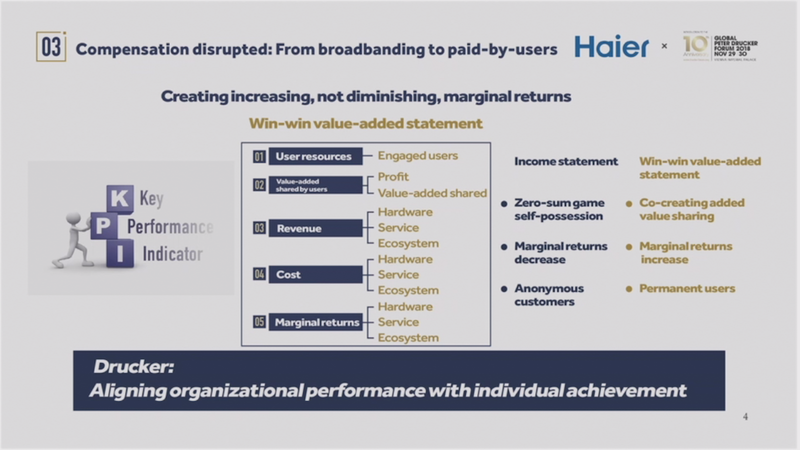 I think that’s relevant because for me, the fundamental basis for ecosystems is the extension of network organisations outside a single organisation, increasingly through the use of digital platforms. 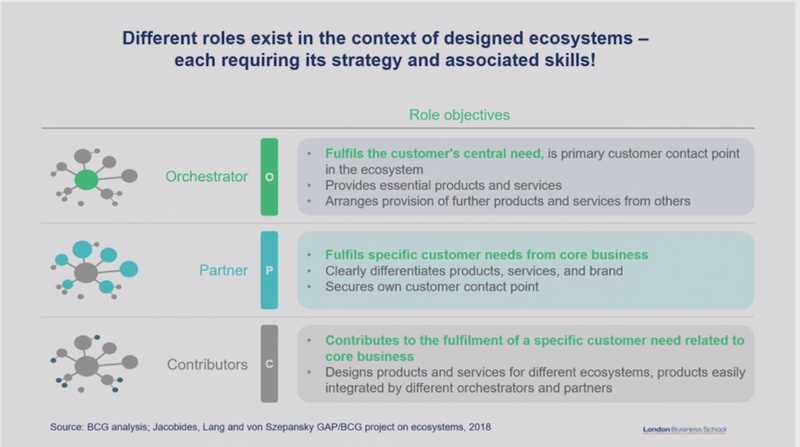 All organisations need to be thinking about their places within these ecosystems, whether as orchestrators, partners or contributors (not everyone can or should be an orchestrator, meaning that business leaders need to be aware of their own ego-systems). 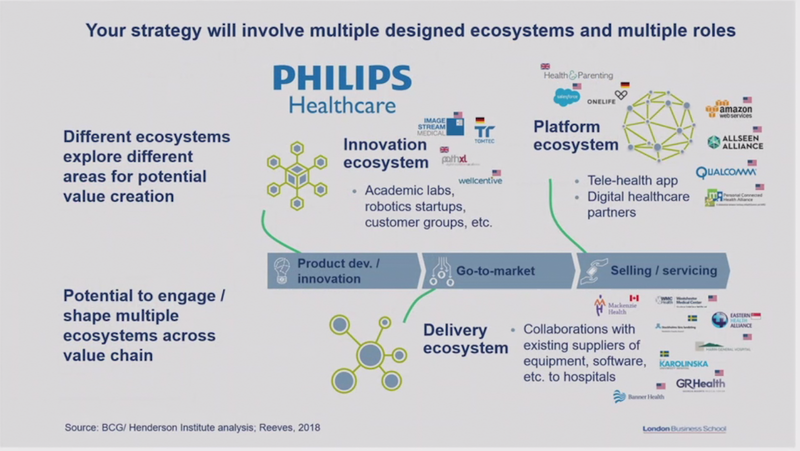 Eg the second slide here is Phillips Healthcare. 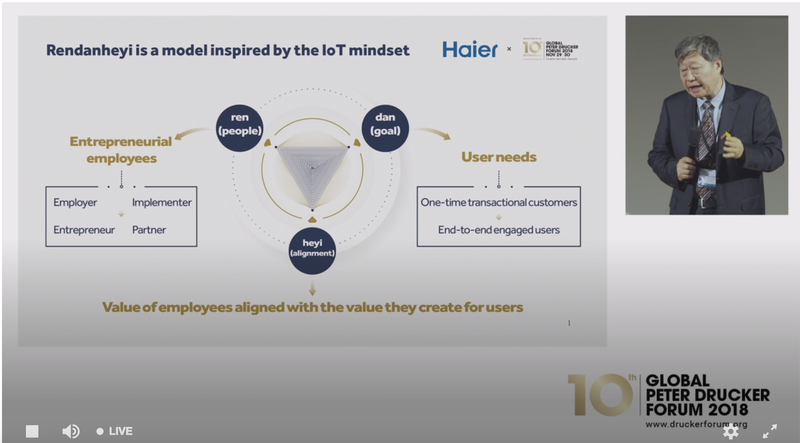 We also heard today from probably the prime example of an ecosystem orchestrator, which is Haier, in a talk delivered by their CEO, Zhang Ruimin, in Mandarin. This wasn’t translated on the live stream so I only got a few additional insights on top of what I’ve previously read elsewhere. Employees – from the economic to autonomous person. Emancipating and mobilising people’s ability rather than seeking balance or harmony. And seeing the world as my HR department. Organisations – from bureaucracy to ‘3 selves’: self employed, self-motivated and self-organised. Compensation – from broadbanding to paid by users. Linking income directly to value provided to customers. This is perhaps the third reason that I didn’t write about ecosystems myself. I was writing about social organisations and ecosystems often aren’t organisations at all, but market based arrangements for getting work done.